Rogers Exhaust Shop offers Fontana's best value in exhaust system and muffler repair, customization, installation, replacement, modification, and sales. All of our exhaust system work is performed by highly skilled mechanics who have decades of experience in optimizing the performance of cars, trucks, vans, SUVs, and RVs of all makes and models. Our expertise and affordable rates have made us Fontana's preferred exhaust shop. By providing high-quality exhaust system services, outstanding customer care, and competitive pricing, our family-owned and -operated exhaust shop has served over 100,000 satisfied customers throughout Fontana, Rancho Cucamonga, Ontario, Riverside, San Bernardino, Redlands, and surrounding areas since 1999, and earned more than 75 five-star Yelp reviews. 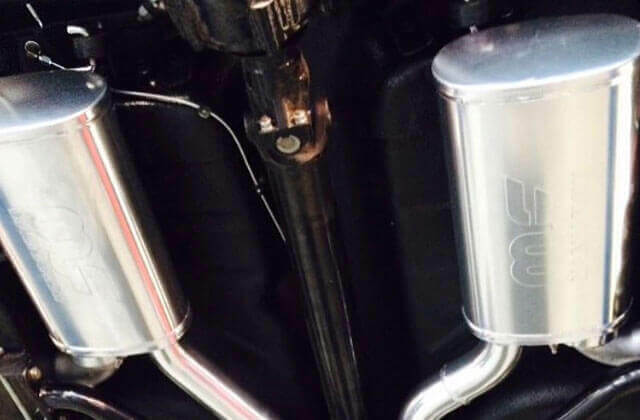 Rogers Exhaust Shop is a local dealer and installer for major brands that offer the industry's leading performance mufflers and OEM-equivalent aftermarket mufflers, such as Magnaflow, Flowmaster, Corsa, Dynomax, AIRAID, Black Widow, Edge, Walker, and AP. Our experts will help you determine which muffler brand and model will give you the performance and sound you are looking for. Each manufacturer has a variety of muffler options for each model of car, as well as different types of resonators, including both louvered and perforated core styles. We also sell mufflers, catalytic converters, and other exhaust system parts directly to the public, can order OEM replacement mufflers, and install exhaust system components that you've bought online. Exhaust system problems are often the result of physical road damage, such as a collision or driving over a rock, sludge in the engine or pipes, vibration issues, or normal wear and tear. If your check engine light is on or if you've noticed strange noises, smoke, or strong fumes coming from your exhaust system, you may need to have your exhaust system inspected. Solutions will depend upon the type of problem you have and your budget. Typically, we will need to replace a component in the exhaust system, such as the exhaust manifold, head pipe, flex pipe, catalytic converter, resonator, muffler, hanger, tailpipe, or exhaust tip, but sometimes we can weld a broken or cracked part, such as the mid-piping or catalytic converter. Call or stop by today for affordably priced, expert exhaust system repairs in Fontana. The technicians at Rogers Exhaust Shop specialize in muffler and exhaust system modifications and customizations. If you've changed any stock components in your vehicle or made other physical changes, the exhaust likely also needs to be modified so you can ensure that you are getting optimal benefit from your upgrades. 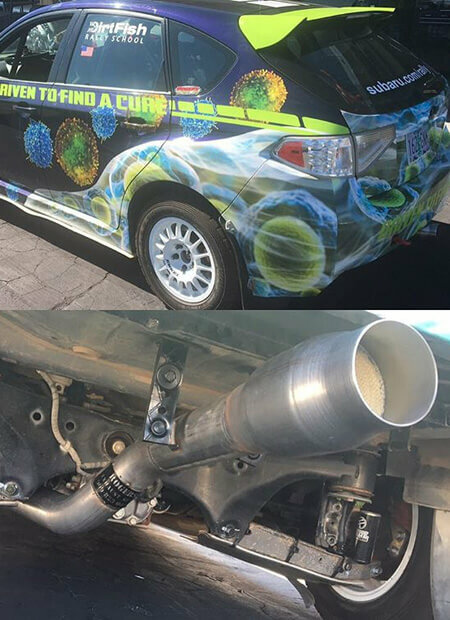 When it comes to exhaust system modifications, we can enlarge the front piping section, transform the exhaust manifold into headers, open up your the airflow with Mandrel bend tubes and pipes, install a new catalytic converter, and more. For those looking to achieve a certain sound, look, or performance, we offer a wide range of exhaust system customization options, from installing new exhaust tips or custom-fabricated skid plates to performing a complete OEM-quality exhaust restoration. With our decades of experience, expert workmanship, extensive knowledge, and wide range of high-quality parts, we're able to recommend upgrades to improve a car's mileage, horsepower, aesthetics, sound, and/or ground clearance and realize nearly any custom exhaust request. We can even custom make an entire muffler and exhaust system for sedans, trucks, SUVs, off-road vehicles, classic cars, and sports cars, no matter the make or model. Call or visit Rogers Exhaust Shop today. We're open Monday through Friday from 8:00am - 6:00pm and on Saturdays by appointment. For exhaust system service and repair requests, we offer free in-shop inspections and quotes. If you are looking for a custom exhaust system, you can come in and talk to one of our technicians about your needs. However, if you generally know what parts or services you want, we can usually provide a cost estimate right over the phone. Our muffler sales, installation, and repair services often cost less than half of dealer prices and are backed by excellent manufacturer warranties in addition to our own lifetime labor warranty. Rogers Exhaust Shop is licensed and insured, and we always comply with applicable California standards and requirements.